1. 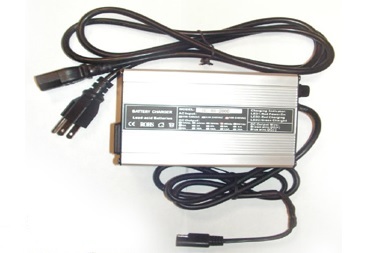 Check if your local mains supply conforms to charger's input voltage 110 or 230V. Then connect the charger system to a wall socket. If charger has switch with OFF position, it MUST be set to ON. 2. LED1 RED confirms AC power on, and the LED2 GREEN confirms charger connects well. 3. Connect the plug or the DC Output cord to battery terminals. LED2 RED confirms charger is charging, LED2 GREEN confirms battery fully charged. (N -> Positive ; L -> Negative ; Brown -> +ve terminal, Blue -> -ve terminal). Note: This chart is based on 4 12V20Ah battery. 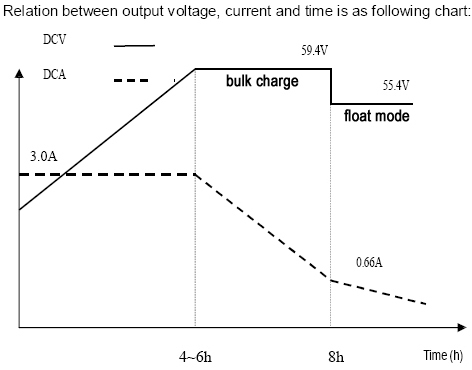 Charging time should be determined by battery amp hour capacity. 1. This charger is designed for Lead Acid or Silicon type batteries only. 2. Avoid charging the wrong type of battery. 3. The battery may be damaged if LED2 cannot be changed to green after a long time of charging. 4. Always place the charger in well-ventilated and dry environments. 5. The charger is designed with aluminum case as its heat sink. Do not cover it to avoid the case from being over heated while charging. 6. DO NOT disassemble charger. Take it to a qualified service person when service or repair is required.